This story begins in the early 1990s when a particular bacterium, then called Pseudomonas cepacia, emerged as a pathogen causing devastating lung infections in people with cystic fibrosis (CF). 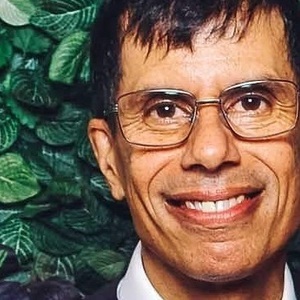 At the time I was undertaking my first postdoctoral position at the University of British Columbia and worked closely with the microbiology laboratory at the Children’s Hospital in Vancouver. Multiple children with CF began acquiring lung infections with Pseudomonas cepacia. Concerned that an outbreak was underway, I developed a simple genetic profiling technique to distinguish strains and showed that certain Pseudomonas cepacia strains had spread between CF individuals at the clinic. Subsequently, strict infection control guidelines were developed which successfully reduced transmission. By the mid-1990s, it became clear that Pseudomonas cepacia was made up of multiple bacterial species - the Burkholderia cepacia complex; I will call them Burkholderia from now on to reduce the complexity! 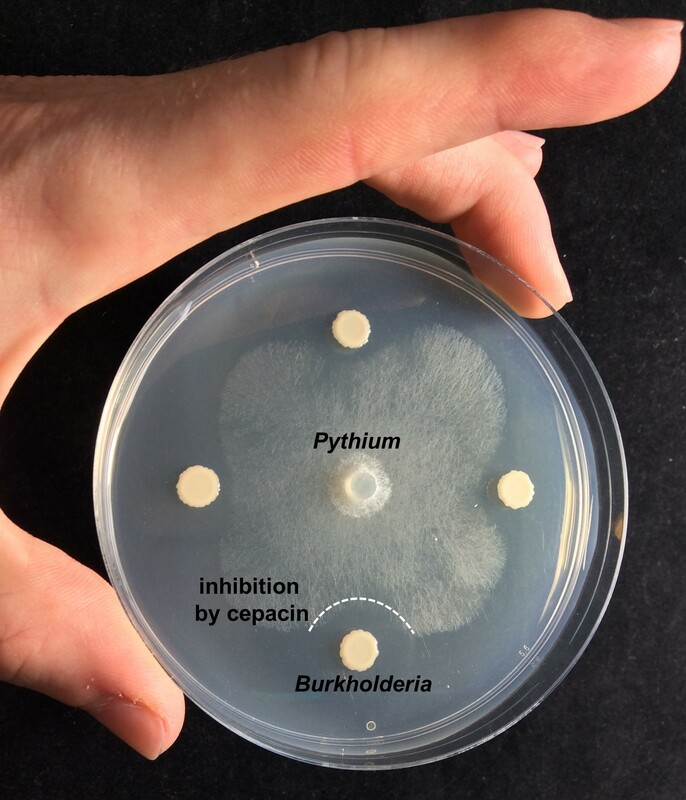 At annual meetings of the International Burkholderia cepacia Working Group (a self-help group set up to promote collaborative research), I met scientists interested in environmentally beneficial properties of Burkholderia such as protecting plants from fungal diseases. Several Burkholderia strains were being successfully used as commercial biopesticides, but the problems caused by Burkholderia in CF led to concerns about the safety of applying them as environmental agents. In 1999, I participated in an advisory panel convened by the US Environmental Protection Agency (EPA) to carry out a Risk Assessment of using Burkholderia as a biopesticide. Ultimately, because of our lack of knowledge, the EPA halted new registration of biopesticides related to bacteria capable of causing human opportunistic infections until they could be proven safe. Biopesticides registered before 1999 were eventually withdrawn and safety concerns made it difficult to obtain funding to study Burkholderia biopesticides. For the next 10 years I focused on clinical research, examining how Burkholderia caused CF infections and tracking the global spread of strains. However, in the summer of 2007, I had a “Eureka moment” finding a strain of Burkholderia ambifaria that could kill the CF pathogen Burkholderia multivorans, and this led to a new line of Burkholderia antibiotic discovery research. It took another 7 years to convince funding agencies to support this research, but with loyal support from collaborators Greg Challis, Julian Parkhill and Tom Connor, in 2014 we began a Burkholderia antibiotic discovery programme with support from the Biotechnology and Biological Sciences Research Council. At the same time as part of management duties, I struck up conversations with Jim Murray (my Head of School) and also a highly charismatic plant biologist. Jim inspired me to work more on Burkholderia-plant interactions and we successfully obtained funding to support Alex Mullins. Alex had the curiosity and informatic skills to mine the genomes of biopesticidal Burkholderia, the green fingers to get the plants growing and the insight to develop novel plant-bacteria interaction studies. With the support of a team of researchers (a few are pictured below), we identified the genes for the Burkholderia antibiotic, cepacin, and showed that it mediated biopesticidal protection against damping-off disease caused by a fungus-like microbe, Pythium. 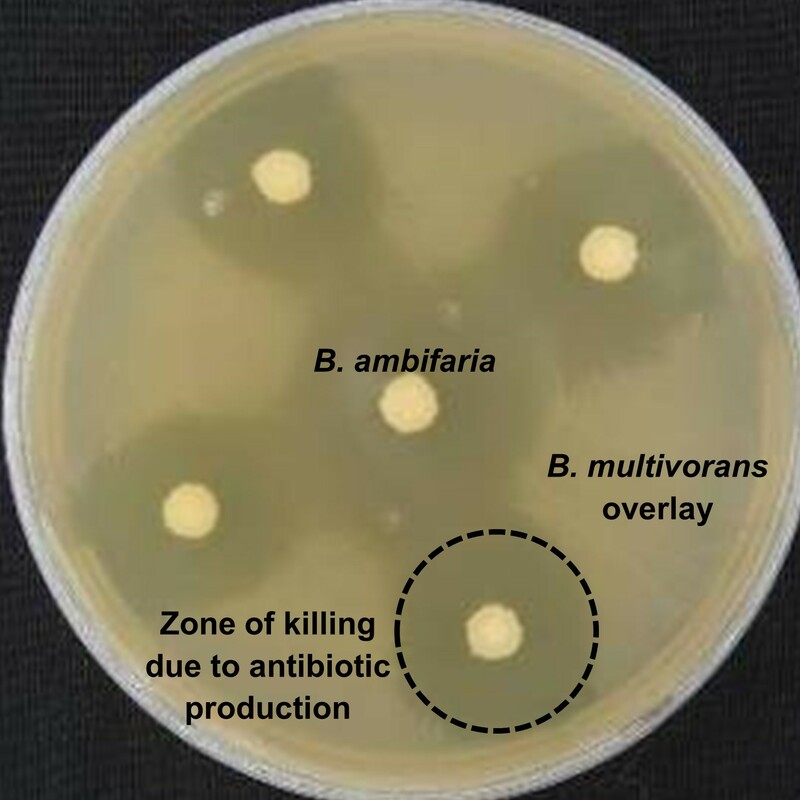 With Greg Challis’s and Matthew Jenner’s help, we also showed that Burkholderia biopesticide strains produce an armoury of antimicrobial compounds - no wonder they were such effective biopesticides! So what of the future - can we harness Burkholderia as safe biopesticides? It’s a question I have pondered ever since the advisory panel in 1999. Highly successful live vaccines have been developed from infectious bacteria by the removal of virulence genes. Could such an approach be applied to Burkholderia biopesticides? Well Burkholderia split their genomic DNA across 3 fragments, called replicons, the smallest of which can be removed. 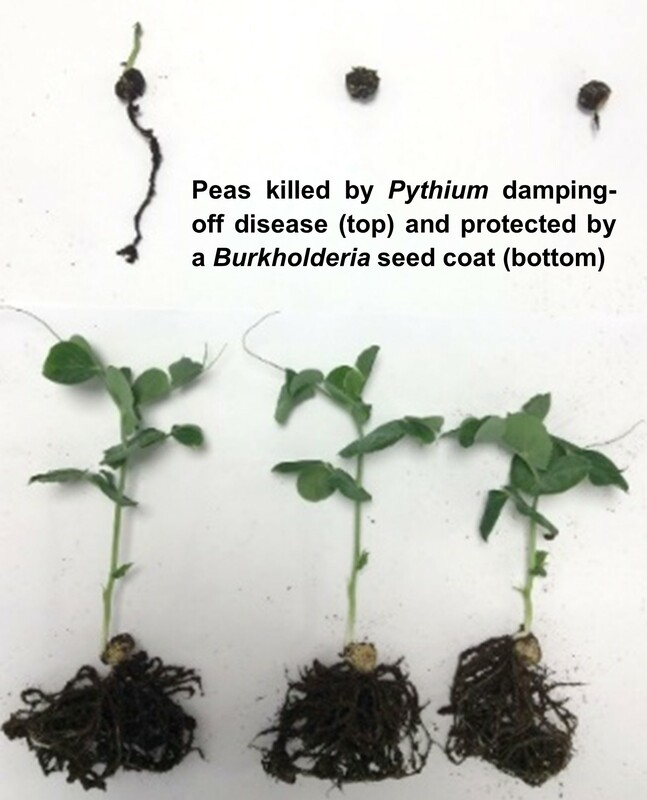 Alex created a third replicon mutant of a biopesticidal Burkholderia strain and demonstrated that it could still protect germinating peas. With the help of Angharad Green and Daniel Neill we showed the mutant did not persist in a mouse lung infection model, opening up the possibility of constructing biopesticidal Burkholderia bacteria incapable of causing infection but still able to deliver plant protection. Finding natural approaches to sustain agriculture and food production without poisoning ecosystems with man-made pesticides is a major global challenge. Beneficial bacteria such as Burkholderia, that have coevolved naturally with plants, have a key role to play in such a sustainable future. Burkholderia are also devastating CF pathogens, but the main species causing infections do differ from certain biopesticidal groups which we show can be made less virulent. We have to understand and weigh up the risks, mitigate against them, and seek a balance that works for all. The paper in can be accessed here as an article in Nature Microbiology.